“I am escaping into Indigenous freedom. I am escaping into Indigenous land and my Indigenous body.” As soon as I read that quote from Leanne Simpson, which opens this diverse, imaginative collection, I knew there was no way I wouldn’t love this book. 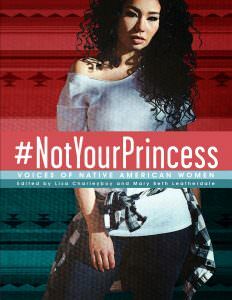 Editors Lisa Charleyboy and Mary Beth Leatherdale created #NotYourPrincess to be “a love letter to all young Indigenous women trying to find their way.” That love permeates every single page. You can feel it in each element of this book—from the layout, to the organization, to the careful matching of art to written word—juxtapositions that feel like the pieces are not only speaking to one another, but carefully opening with one another’s encouragement. Writing and art from such established talents as Maria Campbell, Rosanna Deerchild, Gwen Benaway, Julie Flett, Joanne Arnott, and Danielle Daniel appear alongside emerging talents like Saige Mukash, Helen Knott, Winona Linn, Chief Lady Bird, Aura Last, and countless others. This mix is both refreshing and inspiring. Indeed, one of the collection’s biggest strengths is the sheer range of work collected in its 112 pages. There are poems, comics, short memoir pieces, photographs, paintings, and digital art. There’s even some Indigenous theory, and a very smart—if brief—introduction to the vibrant online Native communities of Twitter and Instagram. Every turn of the page is exciting, which is exactly what you need in a book like this.